The language used on all three of the documents obtained by the Washington Free Beacon show that a unified theme of "who you vote for is private, but whether or not you vote is public record" has been used throughout in an apparent attempt to push voters to the polls. The Free Beacon reported yesterday that Democratic candidate Scott Wallace, who is challenging incumbent Republican Brian Fitzpatrick in Pennsylvania's competitive first district, was using "Orwellian" door hangers that stated, "Remember, who you vote for is private, but whether or not you vote is public record. We can't wait to see that you voted on November 6!" Wallace's campaign never returned a request for comment on the door hangers. 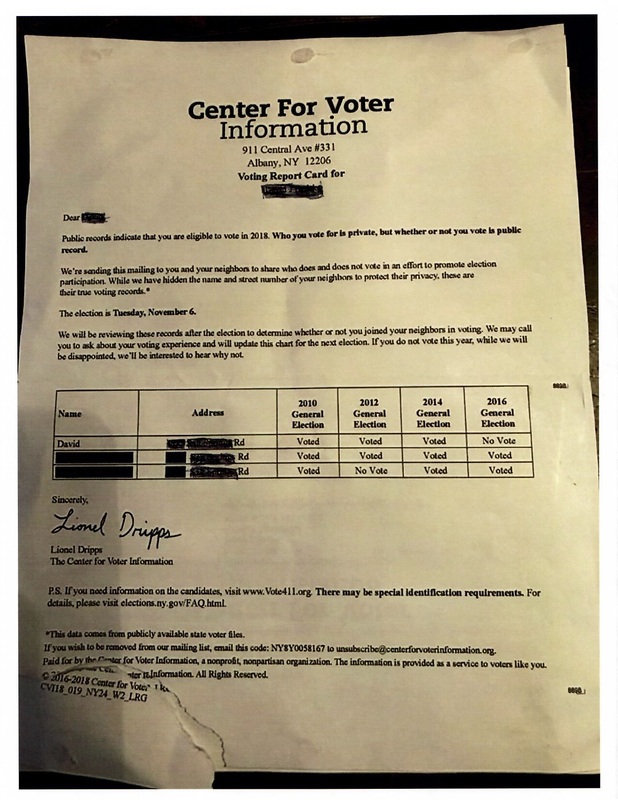 Following publication of Wallace's campaign literature, an individual from Syracuse, N.Y., sent the Free Beacon a similar document from a group called the Center for Voter Information, a self-described "unbiased" organization that provides information about candidates. The document, however, also contains information on whether or not their neighbors have voted in past elections. "We're sending this mailing to you and your neighbors to share who does and does not vote in an effort to promote election participation," it continues. "While we have hidden the name and street number of your neighbors to protect their privacy, these are their true voting records." "We will be reviewing these records after the election to determine whether or not you joined your neighbors in voting," it says. "We may call you to ask about your voting experience and will update this chart for the next election. If you do not vote this year, while we will be disappointed, we'll be interested to hear why not." The message is signed by Lionel Dripps, a Washington, D.C.-based political consultant who is the managing director for program and digital for the Voter Participation Center, the 501(c)(3) arm of the Center for Voter Information, which is the 501(c)(4) arm. Dripps previously worked as the executive director for the Democratic Senate Campaign Fund and as a regional director for the Democratic Party of Wisconsin. When asked why the group was sending mail containing messages along these lines—and especially information on what their neighbors have done in past elections—the Center for Voter Information defended its mailers by saying it has one mission: encouraging people to vote. 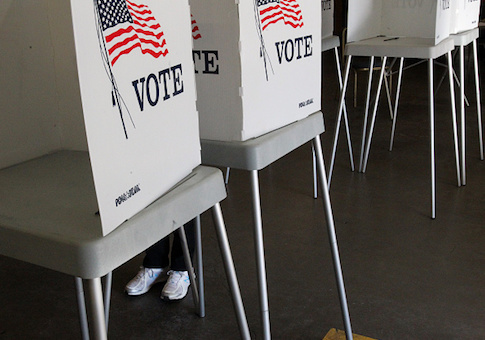 "Whether someone voted in an election is public record," Page Gardner, the founder and president of the Center for Voter Information, told the Free Beacon. "As a civic-engagement group, we use public records to help voters understand their voting records. Those who can vote—and have previously participated—often are inspired to vote when shown their record. It’s a way to provide some meaningful benchmarks and encourage greater involvement in our democracy." "There are millions of eligible citizens in New York who might sit on the sidelines of our democracy for this crucial election," Gardner later said. "And way too many of them come from underrepresented groups of Americans, including African-Americans, Latinos, young people, single women, and others who are struggling to make it in America. The Center for Voter Information is a nonprofit and nonpartisan organization dedicated to increasing the participation of historically underrepresented groups in our democracy. Our only purpose is to encourage people to vote!" Additionally, Free Beacon reporter Brent Scher picked up campaign literature from the Missouri Democratic Party that also contains identical language as what has been used in the previous two states. "How you vote is secret, but whether or not you vote is public record," reads a bullet point on a pamphlet from the Missouri Democratic Party. The Missouri Democratic Party did not respond to a request for comment by press time. This entry was posted in Politics and tagged 2018 Election, Missouri, New York, Pennsylvania. Bookmark the permalink.